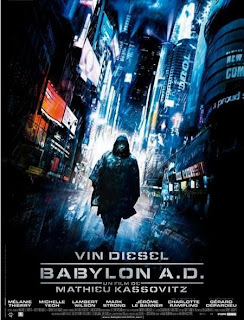 Babylon A.D. stars Vin Diesel as Toorop, a hardened mercenary trying to survive in a dangerous, futuristic world. This movie was given the title "Babylon AD" probably because Babylon (the ancient civilization) is now a colloquialism for any society or civilation that is totally corrupt. Toorop sums up this modernized dystopia with a single statement: "Kill, or be killed." Toorop has learned that he can't trust anyone. His friends and even his employers might shoot him in the back at any moment. Toorop ends up traveling from the Russia to the U.S., where things looks safer on the outsite, but the same kill-or-be-killed rule still applies. An insipid, new religion drives America's subtle, yet deep-rooted depravity. The leader of this religion will destroy anyone and anything that hinders her religious goals. Toorop sees all this, yet he still chooses to help a young girl, Aurora (Mélanie Thierry) unconditionally. He turns down a lot of money and even sacrifices his life to keep this girl from harm. Up to that point, he had learned to survive at all costs, so it's miraculous that he softens himself and, in effect, gives up everything he has learned to die for this girl. We all have had some stroke of bad luck or an unexpected turn in life that we might use to excuse our selfishness. If we wanted to, we all might cling to some aspect of life that seems unfair to justify an animalistic, kill-or-be-killed mentality. But surrendering to selfishness = failure. Those who put themselves first lose in the end, without exception. This is why it is difficult to take part in God's kingdom; this is why the the gospel is offensive to most people. This is what Jesus was talking about when he said, "Everyone who has left houses or brothers or sisters or father or mother or children or farms for my name's sake, will receive many times as much, and will inherit eternal life... many who are first will be last; and the last, first" (Matthew 19:29-30). It takes far more courage to succeed by Jesus' rules, which depend on faith in God, than it to succeed by the world's standards, which depend on self-determination. It's no wonder that Christ's message continues to be difficult, or offensive to most people. At the same time, there is a kind of godly determination. God gives us the chance to choose between bitterness and forgiveness, stinginess or magananimity, freedom in Christ or slavery to self. The few who lead triumphant lives might seem to be failures in the world's eyes because such people tend to neglect themselves for the good of others. According to the world, making oneself look smart and lifting up oneself is the way to success. In God's kingdom, looking like a fool for Christ and building up others before oneself is the way to success. "The King will say to those on his right, 'Come, you who are blessed by my Father; take your inheritance, the kingdom prepared for you since the creation of the world. For I was hungry and you gave me something to eat, I was thirsty and you gave me something to drink, I was a stranger and you invited me in, I needed clothes and you clothed me, I was sick and you looked after me, I was in prison and you came to visit me.'" --Parable of the Sheep and the Goats (Matthew 25:34-36). Not sure exactly how you found my blog, other than some sort of trivial yet still divine appointment, but once I read your heading "The Mysteries of God's Kingdom Revealed Through Movies, Music and Television" I was INSTANTLY a fan. I've been especially interested in the subject, most notably after someone I fellowship with helped to reveal to me several biblical parables throughout The Matrix (which arrived to theaters long before I was a bible student). I'm not much of a Vin Diesel fan, but you've brought attention to interesting parallels and elements of the story correlating to the Kingdom that may have been easily overlooked when you're being bombarded with Diesel's action-hero kitsch factor, and now I look forward to seeing the movie and digesting its story. This blog is outstanding. Thanx for sharing.